We start this chapter, 3 minutes before the bird cage reaches the central district. The citizens begin to panic as the speed of the contraction of the cage increases. The Colosseum gladiators aim to that out Doflamingo, along with the cage. Doflamingo tells them to “bring him Straw-hat“. Gatz concludes that it is likely that there will be many casualties, but he will not “hand Luffy over”, until he recovers. Gatz looks surprised as Law arrives, telling Gatz that he will take care of Luffy. Meanwhile, at the southeast part of town (Sebio), Bartolomeo uses his barrier to help the gladiators push against the cage. Robin and Leo join in to aid, Mansherry releases “Teardelions” (fruits created from her tears). They are able to heal instantly, as they float through the air landing on the citizens. However, the healing effect is limited and the healed will return to their original injured state. Mansherry flies through the sky on the back of Kabu, spreading her tears further. Hack and Usopp appear in front of the citizens. He tells all the citizens “who still have strength left to go to the eastern and western streets to help push the Birdcage“. He tells them to “believe in his friends“. Rebecca is searching for Doflamingo, she see Viola standing in front of him. She warns Rebecca to “not get any ideas“, Doflamingo asks her what is she here for. 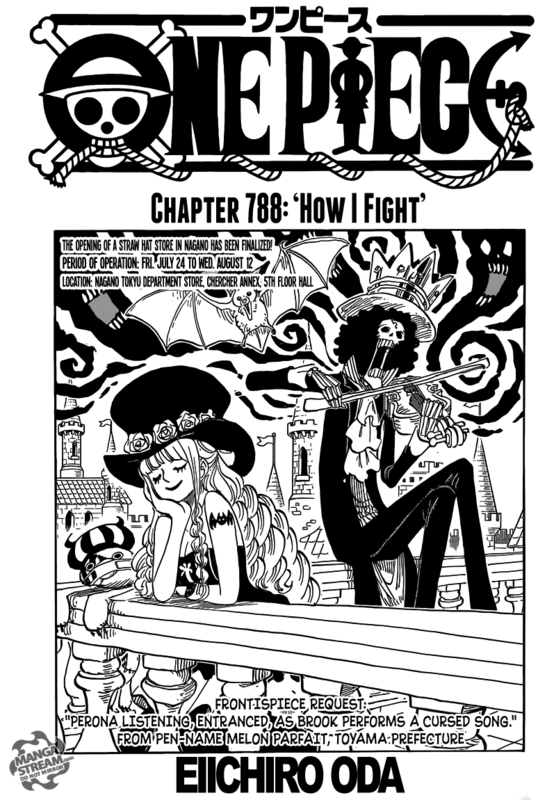 Viola decides that she will face off against Doflamingo, stating that “one of them are going to die today“. 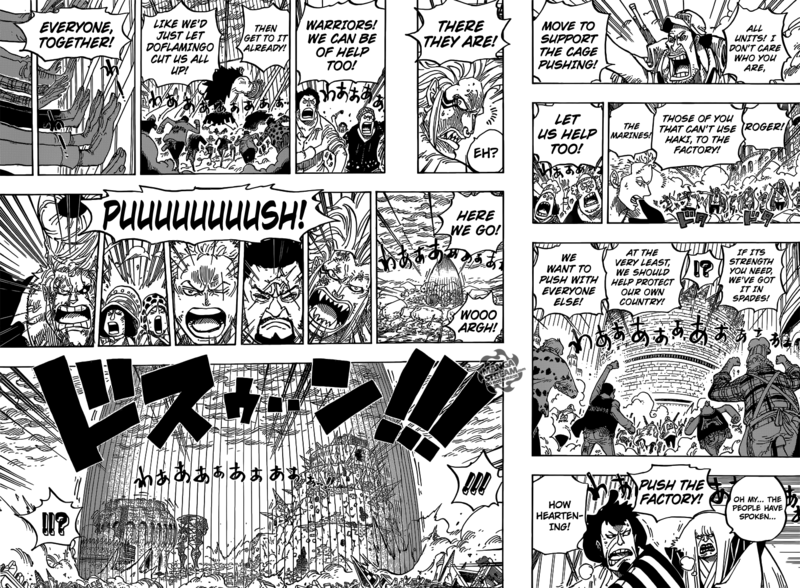 Franky and the dwarves continue to push against the cage, Zoro, Kin’emon, and Kanjuro use their haki embedded swords. Zoro states that “the Birdcage is probably slowing down“, he hears someone walking behind them. Issho arrives to help, stating that “he will help them“. Marines aid in the efforts and so do the citizens. Suddenly, the Birdcage stops, it quickly begins moving again. However, everyone has gained hope as Rebecca calls for Viola, with Luffy still needing one minute. Sasuke attacks Sarada, teary eyed and frightened she yells “Dad”. Stunned Sasuke realizes that it was his daughter. Naruto arrives chastising Sarada for leaving on her own. Sasuke yells at Naruto for “bring children with him“. Chocho thinks that Sasuke must be her father, due to his looks and attitude. Sarada tells Sasuke that she has something to ask him. She asks him if Sakura is her “real mom”. Shizune fills Sakura in on the situation, telling her that she needs to head to the mountain pass. Sasuke asks her “what happened”, she appears angered at this question. She says that Sasuke is “never around”, and it would “kill him to spent time with her and her mother“. She asks “what he has been doing this entire time”, he tells her it “doesn’t concern her”. Sarada runs out, Naruto, flashes back to a meeting between the Kages. Sasuke reveals his concern regarding Kaguya and the White Zetsu. He says that he investigated any traces or remnants of Kaguya. He says that he found that a “ninja gave birth to the white zetsu”. He says that this could mean a potential threat greater than Kaguya. 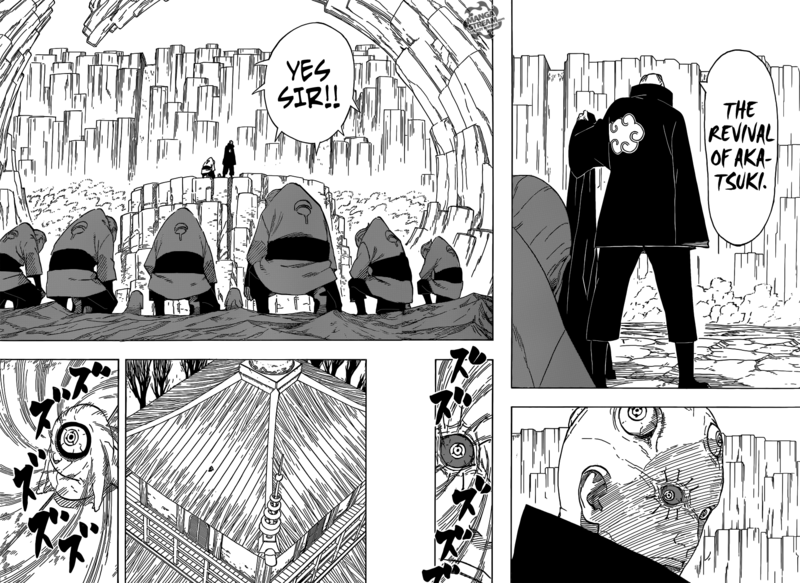 The Kages decides that they shouldn’t alert the general public yet, because its just conjecture. Sasuke decides to go at it alone and conduct a secret mission. Naruto asks Sarada to listen to him, he tells her that Sasuke is a “ninja, greater than any other”. Meanwhile, Shin’s father reveals his face as they head to the revival of the Akatsuki. 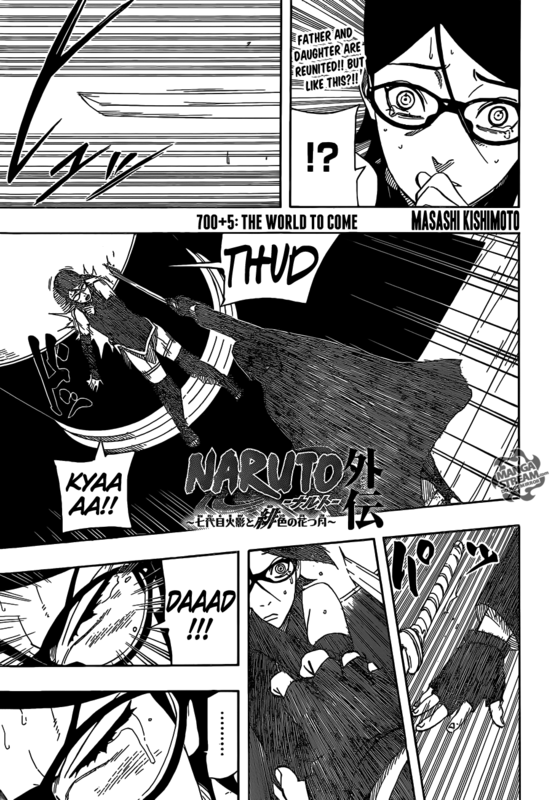 Shin appears behind Naruto and Sarada, attacking. Naruto counters the attack, Shin’s father rushes forward, but Sasuke blocks his way. Shiji is shocked that they are in Wandenreich City, not the royal palace. Urahara confirms that the location is indeed the royal palace based on the coordinates. Shunsui, clarifies stating that “the royal palace as we know it got destroyed“. Shunsui then confirms that Yhwach has reached a new level of power. Sui-Feng points out how “the streets seem to go around something and how there is nothing above them“. Sui-Feng states “the palace has fallen and Yhwach has everything in his hands“. Yoruichi explains that because they were in the Garganta, they were spared the effects of Yhwach’s power. Yoruichi sense’s her brother, to the surprise of Ichigo and his friends. Yushiro attempts to leave to go meet Yoruichi, only he fails to create footholds and falls. Renji catches him and Byakuya notes that “they will likely find it hard to create footholds out of Reishi here because the Reishi concentration is much higher than it was before“. He suggests that it was “likely altered to favor the Quincies“. 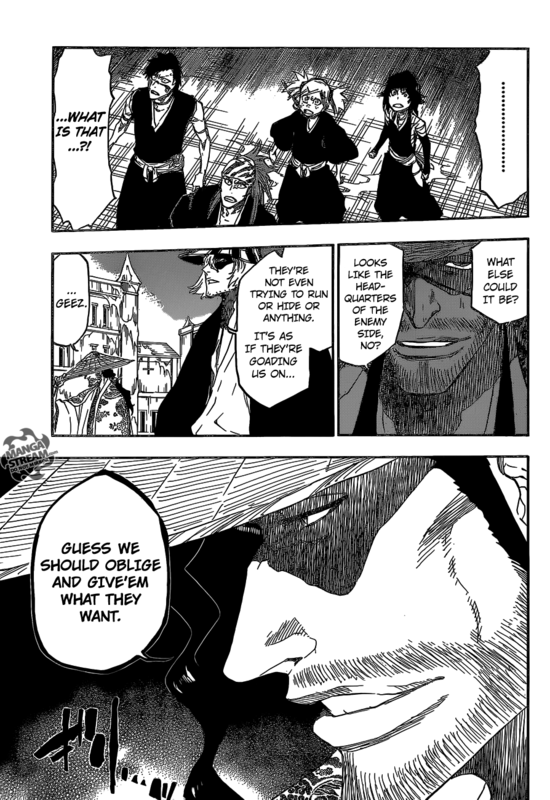 When Byakuya states “that the Soul King is likely dead“, Shunsui acknowledges the reishi of Ichigo and the others. He also notes that “they merely need to defeat Yhwach and find another Soul King“. He tells the Gotei 13 to “move out”, before they move a new tower emerges. 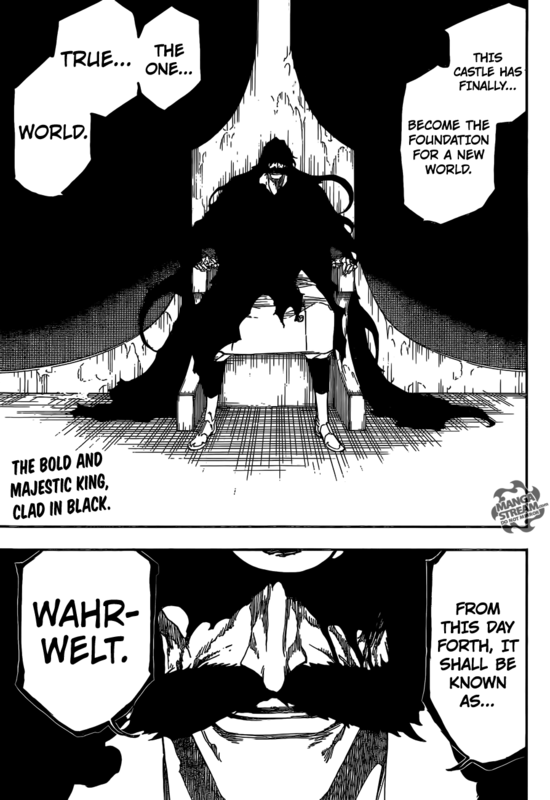 Yhwach is informed of the arrival of Ichigo, the others and the Gotei 13. 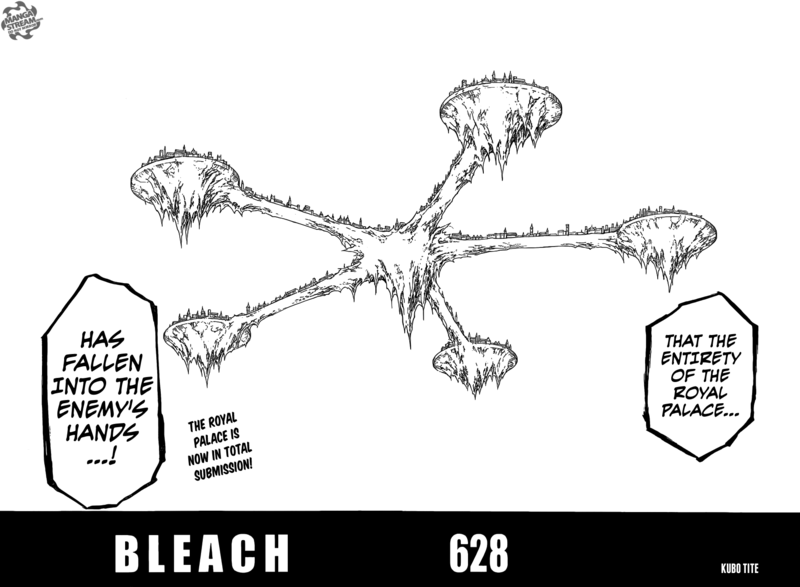 Yhwach seems to ignore this information, as he calls his new castle Wahrwelt. I think this weeks chapters were light on serious action, but a three stories progressed nicely. Mansherry’s teardelions could have been broken, at least they added a flaw in this ability. One problem with this power is that it appears to be indiscriminate. What would happen if Doflamingo gets touched by one of these “delions”. He would be heal of course (if only temporarily), but so could Law and Luffy. That situation is possible, but unlikely. Fujitora aiding everyone and the marines was surprising, however they wouldn’t survive without helping so everyone wins. Viola stepping up to fight Doflamingo was surprising, but she only needs to hold him off for a minute so her strength doesn’t need to be high. In Naruto it is revealed that there may be a greater villain than Kaguya. I hated her, so I’m hoping that the next villain isn’t like her. Sasuke’s treatment of his daughter was better than I thought. He was still a little dismissive of her and her feelings, but I was okay with that. Shin and his father did become more interesting. How did he get so many sharingan’s? Does he use the same technique as Danzo? I don’t see Naruto and Sasuke being troubled by Shin and his father, but I don’t think they are going to try to win. Hopefully, we get some fighting that’s a little drawn out. That said I highly doubt it. Finally, Sakura I personally like her, but is she going to help or just get owned? I hope not, but we’ll see. So, Yushiro is Yoruichi’s brother not her sister. Let’s be honest he looks like a girl, but that’s manga right? The exchange between Yoruichi was comical and generally enjoyable. This chapter was mostly explanation of what Yhwach did to the former Royal Palace. I found the explanation to be acceptable. I wonder what the consequences of the new world, will be in battle. The Shinigami Ichigo and his friends are at a disadvantage due to Yhwach’s alteration of the Royal Palace. This seems fair considering that the Sternritter are out numbered. Finally, where’s Aizen?